If you're planning a long vacation to Yosemite, Malibu, or any other terrain amenable to bicycle tires, consider shipping your cruiser or mountain bike to that locale in advance of your arrival. Granted, if you're staying less than two weeks, it's not worth the trouble. Alternatively, if you ride Amtrak a lot like me, it's no big deal to bring your bike onto the train with you. They have bike racks, and their connecting buses let you squeeze your vehicle into the luggage bays. You might think twice about doing this with a $1,000 bike, but for one that cost under $300, probably it can stomach a few scratches. By contrast, bus companies and the airlines are adamant about you disassembling your bike and packing it in as small container as possible. Preferably a matchbox. The good news is that if you do use a small enough carton, you can ship your wheels for as little as $20 through UPS or FedEx. The smaller the sum of your dimensions, the less you pay. On the other hand, the smaller the dimensions, the more blood, sweat and saliva has to go into the disassembly and reassembly process. Like learning a new skill, however, the mechanics of all this will only vex you once or twice before becoming second nature. Before you know it, you'll be sitting in the airline terminal 20 minutes before takeoff taking your wheels apart and slipping into its carrier as if it were a letter in on envelope. Incidentally, some bike shops will pack your bike for a nominal fee. It's a nice idea, but when your wheels arrive on the other end, what will you do then? You can buy a box online ($100), at a local shipping retailer ($25), or you can get one free. Just call bike shops in your area and see who's got an empty box lying around. These outlets are generally happy to unload their cardboard, since it saves them the trouble of breaking down the material and wedging it into the recycling bin out. And you may have to call around town more than once, since box availability varies from day to day. Also on the down side, the first box you bring home may not work. The one I picked up was a whopping 12 inches wide, and that combined with the height and length dimensions made it over 90 inches (i.e. length + height + width). At the time, I was thinking of putting my bike on a Southwest plane, but the airline had a maximum of 89 inches. Besides that, the FedEx cost quote for those same dimensions was over $60. The box was just too big. So I called another store and retrieved another box. This time I hit paydirt. Unlike the manufacturer's shipping box snagged on my first foray, I'd landed a multiple-use shipping box. It had a thicker ply to it and reinforced, stapled corners. Packing materials for specific bike components were included with the box. That's when it occurred to me that maybe buying the right container in the first place was preferable to simply grabbing any old manufacturer's box off a shelf. Fortunately, the stars aligned for me on this occasion. I ended up with exactly what I needed. The one drawback to this second box was its width - 8 inches, and its length - 37 inches. This would make for a very tight fit for a hybrid cruiser with its 26-inch wheels. Still, it was the right box for my bike dimensions. And the cost quote at FedEx dropped below $30. If you're shipping your wheels as checked baggage, you're restricted to packing bike components, rack, panniers and the few tools you need for reassembly. TSA scanners will likely go gaga if they see water bottles, oil and other petroleum products, a clock, or other items that might lead them to suspect there's a bomb inside. For short-distance travel, it's cheaper to ship by ground. Compare the costs and consider how soon you need your bike when choosing a shipment method. If you're traveling in a single region (e.g. western states), you'll pay less money through UPS/FedEx and the bike will arrive in two or three days. If the distance is far, the $50 Southwest Airlines price will prove more economical. Plus, you'll have your wheels alongside you when you land. See the resource links at the end of these instructions for info on airline requirements, where to buy cartons and other public transit tips. When packing, you'll need to insulate all metal edges that represent poke hazards. The forks on your frame (which sit on the front tire) must be bubble-wrapped or otherwise shielded to prevent them from poking a hole through the box. (You also don't want these thin tips to break. )The shafts on the bicycle seat and handlebars also represent poke hazards. Foam, bubble wrap and carboard tubing will work. Newspaper will not. Bike-specific plastic enclosures can also be purchased. Lock-grip or other glues applied to fasteners by manufacturers may complicate disassembly. Bike makers worry about liability. If your conveyance falls apart as you're speeding along the tour de France, that's on them. So they apply sticky goup that will hold things like pedals in place. On your first disassembly, therefore, consider having a strongman nearby to help you break the grip of those screws. An alternative approach is to use the impact method (i.e. kick the wrench hard). Wedge one pedal against something solid to give you better leverage in yanking loose the first. If possible, avoid disassembling the back wheel. 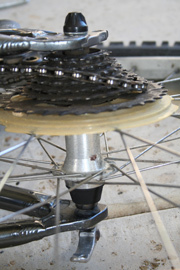 Since it's sort of a pain getting the axil back through the center of the sprocket, especially with your derailer hanging from the frame, leave the back wheel alonge. You almost need four hands to accomplish the reassembly, and you may only have two when the time comes. Even though the axil from end to end may look too long to fit width-wise in your box, keep in mind that if diagonally inserted, you'll have more room to work with when the time comes. The black fastener at the center of the first picture secures the back axil on the right side. You'll want to locate a sheltered, private comfortable place to work whenever breaking down or reassembling your wheels. After you've acquired your packing box, some packing materials and ties, and the right hand tools you can start breaking down the bike. Ties, a lug wrench and set of Allen wrenches. Don't forget your packing materials and an old rag to wipe oil and grease off your hands. Step 1: Remove the bike rack and any other accessory items that stick out. No need to remove the kickstand, however. 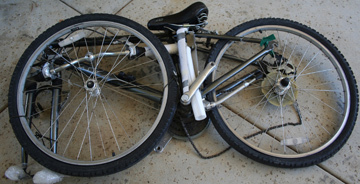 Since a bike rack is usually secured with four screws, remove them one by one and place them immediately into a small container that won't snap open during transport. Step 2: Remove the pedals. This may be the hardest step, but see if you can jar those pedal screws loose from any lock-grip substance used by the manufacturer. 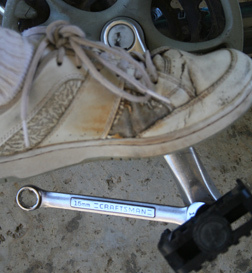 The pedals are directly attached to their chrome handles by way of a metal screw on the end. Use the right-sized lug wrench to retract and remove the cylinders. Mine was 15 mm. incidentally, turning the rubber pedal will have no effect on the operation. You have turn the screw. Also important: Note that on the left-side pedal (i.e. 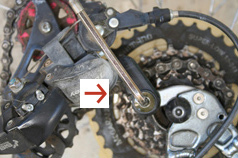 left from the bike rider's perspective), the screw cylinder has to be turned clockwise to remove it. That's because when riding a bike, this pedal naturally turns in a counter-clockwise direction and might eventually unfurl if it were threaded in the normal manner. 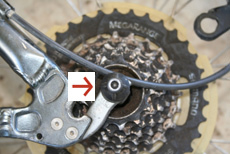 All other fasteners detach when turned counter-clockwise, but not this one. 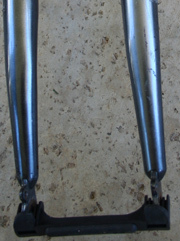 When removed, look at the written letters stamped on the bottom of each pedal - "R" or "L". 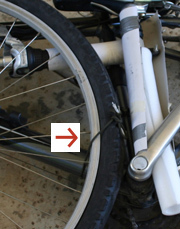 You'll need to remember these designations when reassembling the bike. 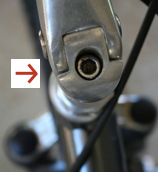 Most bikes nowadays have a simple lever you pull out in order to release the metal shaft. (Notice the little wire I added to thwart would-be bicycle seat thieves.) Then lift the seat upwards till the metal shaft clears the opening. You'll need to insulate the shaft with foam before packing it into the box. Notice the silver Allen wrench inserted into the derailer fastener, in the first photo, just below the back axil screw. Turn it counter-clockwise to loosen the attachment. 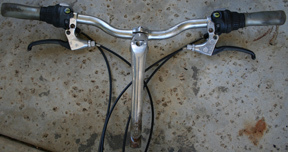 On the average budget cruiser, there's typically one bolt with an Allen wrench head holding the derailer onto the frame. 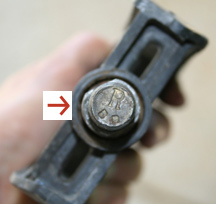 Loosen the bolt, then toss it into your screw container immediately so you don't lose it. Secure the derailer to the frame for transport with a little twine, paracord, webbing or packaging tape. Don't worry about the chain if it detaches from the sprocket. It's not going anywhere. 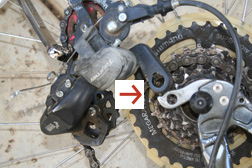 The clasp is pictured on the right side of the first photo, looking down from behind the handlebars. 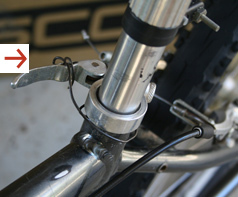 The second photo is taken from the front of the bike and shows how to lift and separate the brake wire from the clasp. 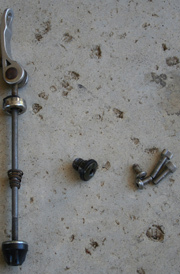 Once you've lifted the forks off the axil, unfurl the fasteners and removal the axil. 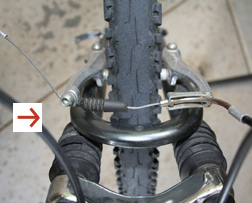 First, loosen the brake pads on the tire by slipping the tin brake line out of the groove in the small metal casing atop the tire. You can create slack in the line by squeezing both long silver levers, then push the tin wire up from the groove in the clasp. It should pop out. Second, flip the tire lock lever outward to release the axil's grip. Third, lift the forks of the frame up off the axil and pull the wheel out. 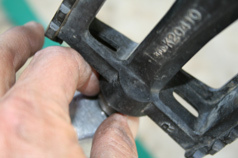 Fourth, remove the axil from the wheel by unscrewing the fastener on the other side. Fifth, reattach the fastener so the spring on the axil doesn't slip off, then put the axil alongside the container holding the bolts/screws you've removed. 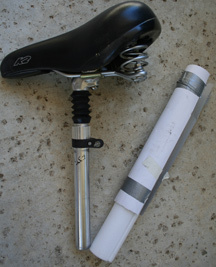 Step 6: Insulate your forks to prevent damage and a poke hazard. 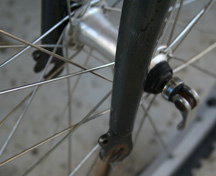 Step 8: Tie your front wheel to the frame. Use a bow tie, if possible, to make undoing the knot easier later. Shove the bike up against the pedal shaft and tie it to the frame so it fits snugly without sticking out. Like the seat, the handlebars rest on a cylincrical shaft that fits inside an opening in the frame. 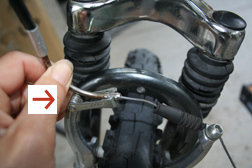 Use the right-sized Allen wrench to loosen the connecting bolt at the juncture where the bars meet, at the top of the bike frame. Next, pull the handlebars upward until the shaft clears the opening. Because your hand brakes and gear lines are attached to the handlebars you'll have to maneuver the bars around so they slip inside the frame. Tie it in two places to secure it snugly against the frame. 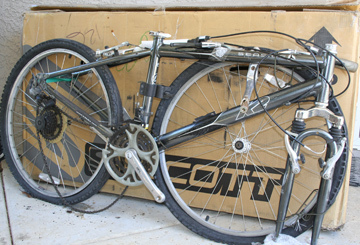 Step 9: Deflate both tires if necessary to fit the bike into the box. To do this, remove the cap on each tire, then stick a finger nail or a pen on the air needle and push it down and release the air. Remember to reattach both caps immediately. You may need to twist the bike sideways, up or downward to finesse it inside the box. Don't worry, even if the bike looks too wide or long, these angular adjustments will afford extra centimeters of room. Make sure every sharp edge with poke potential is insulated. Keep in mind, packaging can fall off if it's not securely attached. Use tape if necessary. 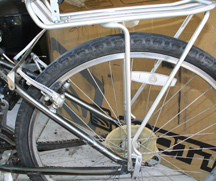 Once the bike's in the container, slide in the bike seat, the rack and any other detached components. Place your tools in a box or sealed bag and stuff that into the shipping container. Add extra packing insulation to keep everything snug and poke-proof. 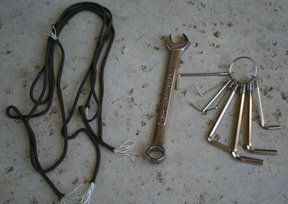 When you're done, you should also have the hardware below ready to package and ship with the bike. The front axil, derailer bolt and bike rack screws.